When it comes to your digital marketing strategy, paid media is likely to play a large and important role in ensuring your product or service reaches your potential customers. If you haven’t yet considered paid media in your strategy, then you are more than likely missing a trick. Paid social – Facebook/Instagram, LinkedIn, Twitter, YouTube and Pinterest – Predictions for 2018 suggested that social channels would account for a quarter of all UK digital ad spend, with an estimated £3.3 billion to be spent across the social networks, a 24% growth on 2017 (E-marketer). These advertising channels are auction-based, where advertisers specify how much they are willing to bid to appear in certain ad spaces (or placements). Once the advertiser sets the bid, the ad enters the auction. There are several methods of paying for your ad placement, including CPC (cost per click), cost per thousand impressions (CPM) or even cost per view (for videos) or cost per acquisition (leads and sales). It is an effective method in generating website traffic and leads/sales, but it can also be used for other objectives; such as video views or completion of lead forms within the platform. What is your business objective – Nearly all the platforms allow you to select your business objective when setting-up your campaigns. Where does your audience spend their time? Each platform has different targeting options based on the data they collect about their users, so if you want to target a business to business audience (B2B) you will probably consider LinkedIn first, even though Facebook can also be used to target individuals by their job title. If you are clear on your business goals, then it becomes easier to select which platform and approach within that platform will help you to meet these. It is important to develop SMART (Specific, Measurable, Achievable, Relevant and Timely) aims and objectives for each platform which will allow you to outline your key performance indicators (KPIs) and assess where each platform sits in helping you to achieve your overall business goal. 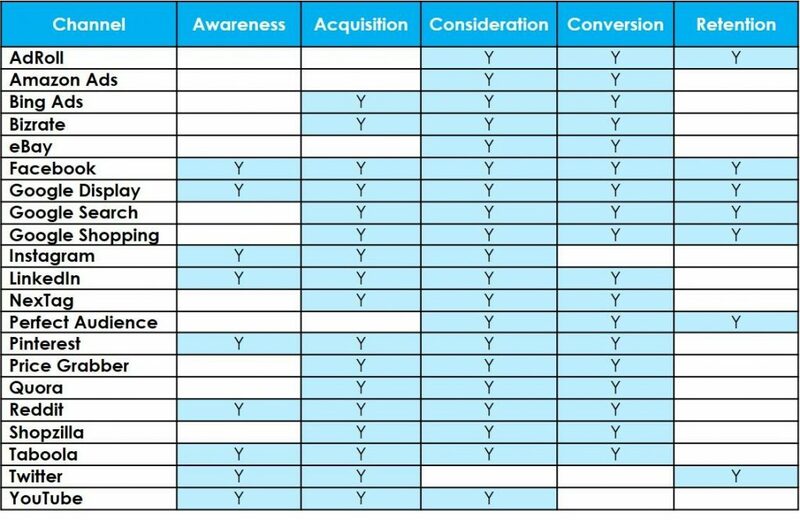 With a whole manner of platforms out there, suitable for both B2B and B2C, and lead generation and e-commerce, how do you decide which platform is going to help you achieve your business goals? Across the platforms, each can be used for a variety of different campaign objectives, you can find the summary of which platforms are recommended for each strategy below. The great thing about all of these platforms is they each provide you with a dashboard that enables you to measure their success against your business objectives and KPIs, and many of these have plugins available to different reporting tools such as Google Data Studio where dashboards can be built so you can see results from all of your platforms in one place. This blog will look at the best Paid Media platforms to help you achieve your business objectives. While targeting all platforms and audiences with the same message may be the quick approach, it won’t necessarily deliver you the best results. A more effective method is to develop unique strategies for each customer segment on the various platforms. The best solution is to develop your own customer personas, which will help you to identify their interests, needs and desires. With these personas you can then target efficiently within the platforms and develop ads that will resonate with them. Social media platforms offer the best solution to persona based targeting as you can build out target audiences based on demographics, interests and behaviours. Search engines such as Google are making ground though with some interest based targeting available such as in market audiences (users who have shown a buying intent in certain categories) as well as life event targeting on YouTube. It is also key to know where your customers are digitally (including platforms and devices) and your customer personas and audience lists should help you identify this. Google Ads is by far the most favoured PPC platform not just in the UK, but across the world, and it isn’t hard to see why with a UK search engine market share of 89% in November 2018 (Statista, 2018). The platform itself is made up of several Google properties that allow advertisers to create ads that appear in both the search results, YouTube and other websites that are part of the Google Display Network (GDN). The breadth of the Google properties makes the platform suitable for almost all businesses with properties that cater to brand awareness, acquisition, consideration and ultimately and most importantly conversion and retention. Google search is where most advertisers start, and this is where you can showcase your products or services to users who are actively searching for them. Google search allows you to connect with potential customers at different stages of the purchase funnel, from initial research where your ad should appeal to consideration, right through to conversion and then retention. As part of Google search, if you are an e-commerce business then you can (and should) tap into Google shopping using a merchant feed, which is essentially a database of your products and their attributes such as the item ID, title and SKU. Your products show to users with attributes such as a product image and price visible within the ad, and these will appear in the search tab either above the search ads or at the side of the search results, within the shopping tab itself or within the images tab. Google shopping is really all about consideration and conversion and is often used in a similar way to a comparison site with the user clicking between ads until ultimately, they find what they are looking for (or the best deal) and make the purchase. Google shopping is applicable to both B2C and B2B but bear in mind that prices need to be VAT inclusive. If you are competitive on price, then Google shopping can yield fantastic results. Finally, for both search and shopping you can re-engage past customers and website visitors using remarketing. Remarketing is based on a cookie that is dropped onto the user’s device when they visit your site and you can create custom lists based on actions that this user takes such as whether they converted on site or engaged with your content, such as downloaded a brochure. You can also upload your own email database and target these users as they search on Google. Another benefit of building remarketing lists within Google is that they will auto create similar audiences, which are populated based on new users who show similar interests and tendencies to users in your existing list helping you to find new customers. Google search and shopping sit within acquisition, consideration, conversion and loyalty and are applicable for both B2B and B2C. Google search caters to both lead generation and e-commerce-based sites, while Google shopping is focused entirely for e-commerce. If you are focused more around brand awareness and driving site traffic, then the display and YouTube networks offer great potential. The Google display network is made up of over 2 million publisher sites, and with people spending more and more time online and 95% of that time spent reading and engaging with content (Google, 2019) there is a huge amount of untapped potential. While the properties are most commonly associated with driving awareness, product releases over the last year have meant the display and YouTube networks are now also able to drive action. Using in-market and custom intent audiences on the display network you can reach users who are actively looking to buy products and services related to your own. On YouTube new ad formats (TrueView for Action) were released which allow you to collect lead data direct within YouTube without directing the user away to your website. Then comes the retention/ re-engagement stage, where again the display network offers great potential to re-engage otherwise lost customers using remarketing. You can also make use of dynamic remarketing which re-targets visitors of your website with products that they viewed, so instantly the ad is familiar. All these ad choices within the Google display and YouTube networks mean that the properties can be used for – awareness, acquisition, consideration, conversion and loyalty objectives for both B2B and B2C, across lead generation and e-commerce. While the market share of Bing is considerably lower (around 10% in the UK) and therefore this is reflected in volume, we very often see great results in terms of conversions and return on ad spend, in some instances this is higher than Google Ads. Over time within our client base we have found e-commerce searches to deliver higher volume and this is reflected in the data below, which shows the variation in conversion rate for different business categories. Like Google you can target users as they actively search for terms that are related to your product or service and capture them in the consideration and conversion phase and as an e-commerce business you can make use of shopping ads with a merchant feed. There is remarketing potential within Bing Ads, with the low search volumes though this yields fewer results than Google. Bing Ads should be used for consideration and conversion and is applicable for both B2B and B2C for lead generation and e-commerce. Amazon is a powerful and growing force within the e-commerce remit, and in February 2018 it was reported that Amazon was now the 5th biggest retailer within the UK (Verdict, 2018). This growth is spurred on by its Prime members, that are said to exceed 8 million within the UK alone (Yahoo, 2018). Amazon allows you to connect to users as they search for products within the interface, meaning that by making use of sponsored ads you can place your products right in front of them at the point in which they are ready to purchase meaning there is no greater platform in terms of delivering an ad to a user to influence conversion. There are several other ad formats within Amazon such as sponsored brands which allow you to showcase 3 of your products at the top of the search results which will trigger the ad based on keywords that you input. This ad format is great for brand awareness and consideration but delivers little in terms conversions. Amazon Ads should be used primarily for consideration and conversion and is applicable for both B2B and B2C across e-commerce. Facebook can be leveraged for many business goals including building awareness and connections, driving website traffic and to sell products and services. While Facebook has built a reputation of being more suitable for B2C marketing, it has some great features that lend themselves well for B2B and is often more affordable than other social platforms such as LinkedIn. Within Facebook, you can target audiences based on demographics, interests, behaviours, employers, job titles and more. This opens a wealth of potential to drive brand awareness to a highly engaged and relevant audience which enables you to build on your customer relationships. Within Facebook you also have the potential to connect your merchant product feed, and team this up with a remarketing list to deliver dynamic product ads to re-engage users based on products they viewed on site. Like Google you can also upload your email data base and either target these past customers or site visitors or create a lookalike audience where Facebook goes out and looks for new users who share similar interests and demographics to your original customers. Facebook can be used for – awareness, acquisition, consideration, conversion and loyalty, with a focus on awareness, acquisition and consideration. Facebook can be used for both B2B and B2C for lead generation and e-commerce. Instagram sits within the Facebook platform, but you can develop specific strategies for the platform itself. Being an image based social network it is important that you have highly visual content. On Instagram worldwide there are 500 million active daily users (Statista, 2018), with the like button hit on average 4.2 billion times per day, providing a very engaged network of users. The platform allows the display of wealth and self-expression and this paired with celebrity brand endorsements provides a perfect setting for e-commerce businesses to adapt their digital strategies to incorporate Instagram social media marketing, as well as influencer based strategies. Essentially if you can promote your product or service with image or video then Instagram is the perfect platform for you. You can use image ads, video ads, carousel ads and stories to promote your products and services. Instagram can be used for awareness, acquisition and consideration for e-commerce-based businesses as a first point, but it does lend itself to some service-based businesses such as hairdressing and property renovation. It can be used for both B2B and B2C. LinkedIn is a great platform for B2B social media marketing and can be used to connect with a professional audience. The platform allows you to target based on attributes including company size, job function, job titles and interests. Due to the nature of LinkedIn it sits as a B2B platform and should be used for awareness, acquisition consideration and conversion. Twitter ads offers advertisers more targeting options than Facebook, for example; you can target based on keywords, hashtags and user handles. Twitter is a very engaged platform, but often users are reluctant to leave. Therefore, it lends itself to awareness and consideration, but you should not anticipate high levels of conversions from the activity. The most commonly used paid tactic in Twitter is promoted tweets which allow you to display your tweets to users who are not already followers, and you can do this by defining your target audience. You can also capitalise on trends using the promoted trends function which allows you to promote a hashtag and appear at the top of the trending topics list. Due to the nature of Twitter it sits more as a B2B platform and should be used for awareness and acquisition, as well as loyalty in the form of customer engagement. Pinterest is a great platform for life moment related products and services such as weddings and house purchases, with 85% of women users using Pinterest to plan these moments (Pinterest, 2018). It is also a great platform for product discovery amongst millennials with 59% discovering new products on the platform (Kleiner Perkins, 2018), and while Instagram has almost 4 times as many users, Pinterest is on Par for product discovery. Pinterest can be used for both B2B and B2C to drive awareness, acquisition, consideration and conversion. It can also be used across both e-commerce and certain lead generation business verticals. For lead generation you can look to promote engaging info-graphics, brochures and whitepapers. Reddit is one of paid media’s secret weapons that not everyone has started to tap into yet. Reddit delivers a platform of highly engaged groups of people, who also happen to have a lot of influence. If you can get these on board with your brand, then they will make great brand advocates for you. There is a network of over 130,000 active interest based communities where people can discover topics, conversations and content that is relevant to them. You can use Reddit to target users with diverse interests and deliver ads to meet your business objectives whether that be to start conversation and power brand awareness and consideration, or drive sales and leads. Your ads will be displayed to highly engaged communities as they are exploring and browsing content. Reddit can be used for both B2B and B2C to drive awareness, acquisition, consideration and conversion across e-commerce and lead generation. There are a wealth of platforms and targeting options to choose from within each, but by understanding what platforms are available, what features they offer and which of these your target audience would be using then you are well on your way to developing your paid media strategy. If you are unsure which platform will yield the best results for your business objective then get in touch and we can help to develop your paid media and digital strategy using our new A10 framework – download your free copy here.